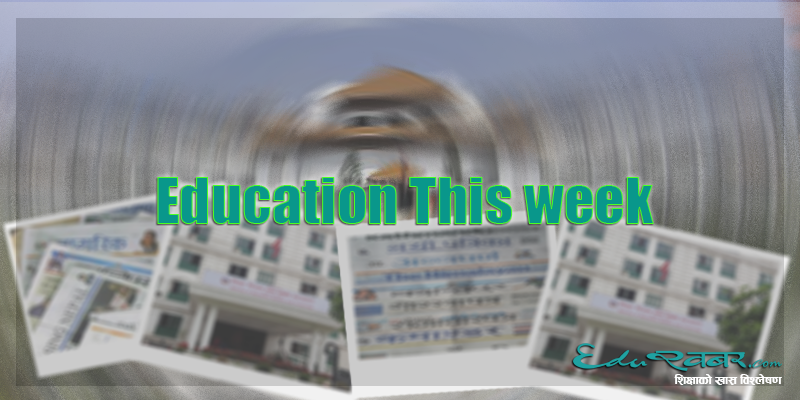 This week there was considerable decrease in matters related to education in media. Subject based license for teachers and an opinion about national curriculum where the only matters about policy. School closure for political demand was condemned. Innovative approaches by different schools were covered in media. There is increase in news reports about sexual assaults in schools premise. Critical state of Madarasha schools and lack of government attention was highlighted. President of Nepal’s speech that highlighted the need to invest and focus in education to ensure prosperity of the nation was part of the editorial and followed by matters. An international news about curriculum about depression highlighted in American schools made it in front page in The Himalayan Times. The only news about medical education this week was about students of Gandaki Medical College starting relay hunger strike stating that the college had fleeced them. - Subject based license will be required to become a permanent teacher according to Teacher Service Commission’s new directive. This is a new approach which will ensure diversity and depth of knowledge among teachers for specific subjects. The impact of such approach in management of teachers in public schools is yet to be reported. At present, most public schools donot have sufficient teachers as required and in many cases same teacher teach multiple subjects in rural schools. In many cases school peons have been reported to be teaching in classrooms in lack of teachers. - School Closure for Political Demand was condemned in media. A political party had called for closure of School’s to demand release of their cadres caught by police for caring unauthorized weapons. An article stated that lack of security of schools was the reason for success of such politically driven School shutdowns. - Critical state of Madarasha schools was also reported in media this week. The lack of attention by the government to support the infrastructure needs and support of curriculum and teacher development was also highlighted. The delay in recognition of higher education achieved through Madarasha is yet to be recognized by the government, and have cost many students opportunity for higher studies. The article has highlighted the urgency for special education and the impact in individual’s life due to delay by government agencies to address the needs of the religious schools. The High Level National commission for Education has recommended special support and mainstreaming of the religious schools with separate commission to regulate and support them. -Honorable President of Nepal, Bidhya Devi Bhandari’s speech that called for the government and broader society to focus on education to ensure prosperous future was reported in the media and became an issue of editorial. The speech highlighted the fast changing world and the need to ensure new skills and perspective among new generation to catch up with the changing context. Though it is not uncommon to hear government representatives speaking for the welfare of the school and education system. At present context when federal government structures are being defined and focus of different issues of development reshuffled, education could achieve a higher priority if the political leaders come together to ensure priority in innovation and reform of school systems. - International news about education this was was about a practice of school kids being taught about metal health and depression in America. It was reported that suicide was the second leading death cause in Americans aged 10 to 18. Different efforts and government programs to ensure children learn early about mental health was discussion in the front page news in The Himalaya Times. The effort to capacitate them to identify early depression and metal conditions among class mates and themselves could help students with needed early support. This effort of the agency can be of relevance to part of the country where suicide among young population is increasing daily. It can also be considered how different agencies are using school systems as a platform to address social issues and to influence broader societal change through school curriculum. The approach to link schools and curriculum to address urgent and present socio-cultural conditions identified in local context has yet to be seen in practice or in coverage on media. - An international news chosenfrom BBC online news portal this week called to ‘overhaul England's 'narrow' A-levels. It stated that England's A-levels are among the narrowest upper secondary systems in the world and need radical change, the president of the Royal Society will say in a speech on Tuesday.Nobel prize winner Prof Sir VenkiRamakrishnan wants an independent review of post-16 education, and exams transformed within 10 years. While A-levels are being considered as the most recent education system in Nepal, the news discusses about the lack of relevance of this system that was stated in 1951. The article questions the adaptability of studentsthat are taught specific skills and narrow subjects, to the fast changing future of work. Education in Nepal at the moment is focusing of skill based technical education from early childhood, to ensure employability of the students after school. 'Education this Week' is a joint effort put to analyze the press coverage of education in Nepal’s print media published in Kathmandu. The main aim of this effort is to identify and explain major education issues picked up by the media and give back and foreground of the news.This, we believe, will help policy makers and other responsible people to keep abreast with ongoing concerns and discussions on and around education. 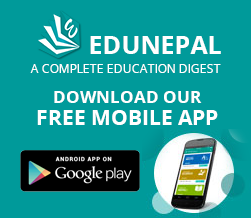 EduKhabar, in collaboration with the Center for Educational Policies and Practices (CEPP) , has produced this analysis based on the news printed in Kantipur (Nepali) and The Himalayan Times (English), Dailies, Himal Weekly(Nepali) and BBC.com(international online portal)between Feb 6, 2019-Feb 12, 2019 (Magh 23, 2075- Magh 29, 2075) - Editor.